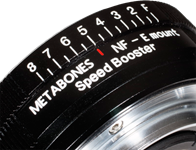 The new 'Devil's Speed Booster Q666 0.50x' from Metabones lets you mount Nikon F and G glass to your Pentax Q, and get a working aperture of up to F0.666 if you're using an F1.2 lens wide open! If you were disappointed by reports that the Sony a9 struggles with adapted Canon glass, you might be able to take some comfort from Metabones' latest update. 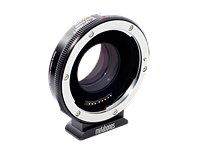 Metabones has introduced Nikon G-type versions of its Speed Booster lens adapter for Micro Four Thirds and Sony NEX cameras, which include a control ring for aperture setting with lenses that don't have aperture rings of their own. 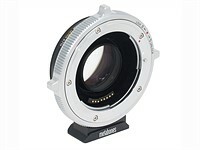 The Speed Booster itself is a lens adapter that that reduces the focal length by a factor of 0.71x, and increases the maximum aperture by 1 stop, effectively allowing lenses to give very similar angle of view and depth of field control on APS-C mirrorless cameras as they do on full frame. 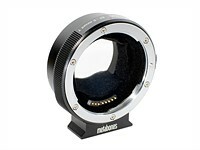 The Nikon G-type adapters are available to buy now for $429 from Metabones' website. 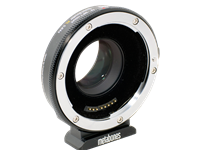 The Metabones Speed Booster is a unique adapter that allows you to mount a full frame lens on an APS-C camera and achieve a significantly wider field of view as well as an extra stop of light gathering ability. We take a look of the potential and challenges of this intriguing concept. 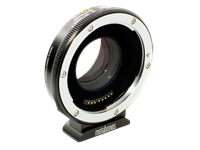 Specialist accessory manufacturer Metabones and optics company Caldwell Photographics have jointly announced the 'Speed Booster', a lens adapter for mounting SLR lenses on APS-C and Micro Four Thirds mirrorless cameras that reduces the focal length by a factor of 0.71x and increases the maximum aperture by 1 stop. The Speed Booster also promises sharper images compared to using the lens with a simple adapter. 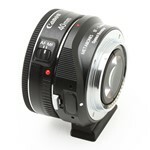 The first version will allow use of Canon EF lenses on Sony NEX bodies, and will be available this month from Metabones' web site for US$599. Support for additional lens mounts (including Nikon F) and camera systems (including Fujifilm X and Micro Four Thirds) is also planned. Metabones has updated its EF to NEX Smart Adapter II, allowing recent Canon lenses to autofocus on Sony E-mount cameras. As with most systems that attempt to use DSLR lenses on contrast-detection-based AF cameras, the focus speed is considerably lower than when used on their native cameras. 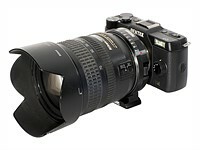 However, despite not being able to use the hybrid-AF system from the NEX-5R or 6, Metabones claims performance is often better than Sony DSLR lenses being used with the original LA-EA1 adapter. The adapter costs $399, with existing Smart Adapter II owners able to upgrade for $50. 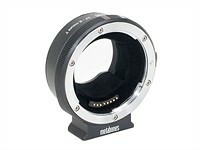 Metabones has announced an updated version of its Canon EF adapter for Sony NEX E-mount. The second version of the Smart Adapter will feature a screw-on Arca Swiss-style tripod mount, improved anti-reflection shieding and a mode that releases the aperture and stops image stabilization to reduce battery consumption. 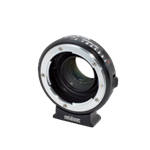 As with the original version, the Second Edition Smart Adapter offers aperture control, image stabilization and EXIF reporting compatibility with most EF and EF-S lenses. It will be available from August 2012 at the same $400 list price as the existing version. 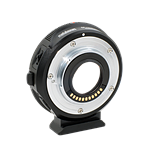 Canadian lens interface experts Conurus and Sino-Japanese adapter maker Metabones have created an electronic 'Smart adapter' for using Canon EF lenses on the Sony NEX's E-mount. The adapter is manual focus-only but allows control of aperture and the use of the image stabilization on Canon IS lenses. Full lens information, including focal length, aperture and lens IS is reported back to the camera for EXIF, allowing the use of all P,A,S and M modes. 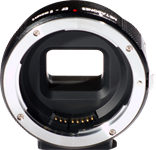 The adapter also features a 'Wide Open' button that opens the aperture up for fine focusing, with the lens otherwise stopped-down to the chosen aperture, giving accurate depth-of-field in live view. It will cost $399.